It was billed as the main event of the summer, at least for comic book fans. Marvel Studios had two films in contention for the superhero crown: One about a Norse God who wields a mighty hammer and the other about a super soldier draped in the American flag. The latter had the clear advantage, if the advance buzz was to be believed. DC Entertainment, who also had a flagship character in the race, stumbled out of the gate with a clumsy marketing campaign that preceded a mediocre film. The Norse God was off to a sturdy start and solid finish. It was the super soldiers race to lose, or so it seemed. When the dust settled, a chimp was left standing with the first place trophy firmly in hand. That’s right. The modestly budgeted (relatively speaking) reboot of 20th Century Fox’s 43 year old science fiction franchise managed to outdo all four of the other so called superhero films that invaded multiplexes this summer. How did a film dumped in the summer blockbuster graveyards of August manage to pull off such a feat? There is a deceptively simple answer to that question. The films endearing and amazing central character: Caesar. The smart and scrappy little primate has everything audiences could possibly want in a larger than life hero and more. Neither Thor nor Captain America: The First Avenger were bad films by any stretch. In fact, both were quite enjoyable. Neither, however, managed to be more than the sum of its parts. They bore all the characteristics of standard product from the Marvel Studios assembly line, which dutifully continues to use the first Iron Man film as a blueprint. Thor especially had more than a few similarities to Shell Heads first cinematic outing. While this helps the integrity of Marvel’s cinematic universe, is also makes their films seem overly familiar when the studio should be striving for the exact opposite. The superhero formula needs to be constantly rejuvenated to stay fresh. Despite its status as the seventh film in a decades old franchise, Rise of the Planet of the Apes provides the requisite freshness by offering audiences as unlikely a hero as they will ever find. Caesar is not human being enhanced by drugs, or a disgraced God that walks among men. He’s a chimpanzee, equipped with all the expected strengths and limitations. His only superpower is his superior intelligence (in relation to others of his kind), a blessing bestowed upon him by the experimentation his poor mother endured. He wins the audience over because his motivations are simple. He wants freedom for himself and his kind. It doesn’t get more human than that. When one compares Caesars motivations to that of Thor and Captain America, the two Marvel characters are left sorely lacking. Thor was a spoiled child in need of severe discipline. Drunk on his own power and insolence, he is cast down among mortals to learn a bit of humility. Given the current animosity towards the privileged in this country, such qualities are likely to elicit a limited amount of sympathy. Steve Rogers gets duped by his own government, who exploit his weaknesses to their own ends. He then becomes a both their pawn and a tool for propaganda. Again, with the way that our military have been abused and exploited over the past decade, it’s hard to know whether to root for Captain America or feel sort of sorry for him. So we are left with Caesar the chimp, a primate who’s emotional and intellectual IQ’s grow exponentially over the course of a feature length film. The audience is made to care for him, his plight, and goals. 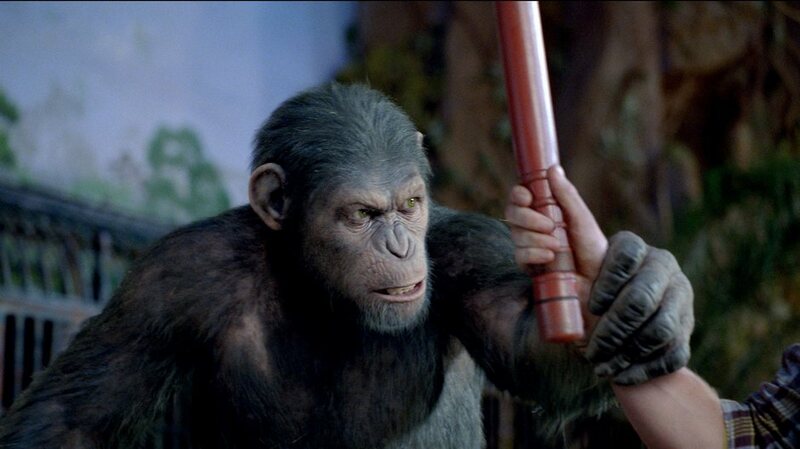 By the third act of Rise of the Planet of the Apes, Caesar has won over the hearts and minds of both fellow apes and filmgoers worldwide. He is everything that a great hero is supposed to be: strong, smart, visually marvelous to behold, and endearingly human. Hail Caesar, the first of a new breed. Marvel and DC would do well to take notes.